I have always considered myself a Libertarian. When I take political quizzes, they consistently identify me as a Libertarian because I usually choose any options that require the least amount of legislation. Donald Rumsfeld is famous for making the quote "you go to war with the army you have, not the army you want". Recently I have been thinking, similarly, that you must create laws for the society you have. In an ideal "Libertarian" world, there could be no laws at all. But in reality, you must legislate to the extent that society has weaknesses. For example, there is very little liberty in a mental institution, or prison. This is because the residents of these "societies" have not demonstrated an ability to properly conduct themselves without outside intervention. Once you accept the fact that some laws are required, it simply becomes an issue of examining each aspect of society to determine if it has degraded to a point where legislation is required. For example, if you have a society where people regularly commit mass shootings to become an instant celebrity on 24-hour TV, then at some point laws will be needed to restrict the access people have to guns. It is wrong, and goes against the way things should be, but at some point it becomes necessary. You create laws for the society you have, not the one you wish you had. So when someone asks "are you in favor of stricter gun control?" the answer should depend on when they are asking the question. If they are asking in 1776, the answer would probably be "no". But if they are asking in 2007, I would probably say "signs point to yes". 1. Forgetting whatever you might have been told, which of the above do you think is the most likely to be the truth? 2. If you had to put faith in one of the above, which would be the most comforting on a daily basis? I think most Americans would answer (a) to both questions. Maybe some would go with (c), which is similar. The impression that I get from most people that I talk to is that at some level they think (e) is the most likely but they still choose to go with (a). It seems surprising to me sometimes, given so many examples of bad things happening to good people, that more people wouldn't prefer to take their chances with (e), as compared to (a). About 50 or 60 people were shot today here in Virginia. Many of them are dead. Geraldo and Greta and Keith and Brian and Katie and Charles and Joe and Tucker are falling over each other trying to report the highest headcount, get the latest 20 second video feed to add to the loop, and blame everyone but the criminal. At least I guess that is what they are doing. I don't know, because I am sitting here in the quiet darkness, listening only to the howling wind and my fingers tapping on the keys. At times like this, everyone is praying for this or that. My wish is for the talking heads on TV to apologize to all of us for what our nation has become. And for the subscribers to People magazine to apologize to the family of Princess Di. And for the administrators at Virginia Tech to boldly recognize this random act of terror for what it is, and leave the school exactly the beautiful place that it was on April 15. The same beautiful place that I visited for just a single night 17 years ago on a road trip to New Orleans. But I fear that next semester the metal detectors will be installed, and MSNBC will provide "breaking" cell phone video of the next shooting in the next town, and the terrorists will have won. No, this is not about the 2008 Presidential Election. 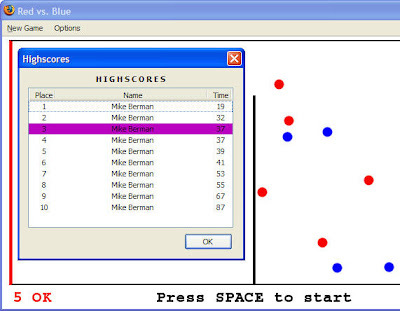 It is a little Firefox entension game called Red vs. Blue. This is a very simple game which you can either master or concede defeat to in less than 30 minutes. Warning: it is a bit maddening. I think air traffic controllers, hockey goaltenders, and parents with four or more kids would probably fare well in this game. As always, below are my high scores (Normal level) if you want to try to beat them (Firefox only). One interesting thing about this game is that it will terminate play with a dialog box as soon as a winning position is achieved (i.e. all of the red balls on the left, and all of the blue balls on the right). An interesting thought that occurred to me is whether the game would ultimately win "by itself" due to essentially random brownian motion in the field of play. There are 20 balls in the game, that can each be in one of two positions. So it seems clear to me that there are 2^20 = 1,048,576 total possible positions. There are 604,800 seconds in a week. So assuming a ball is transferred from one side to the other on average roughly once per second, it would take about 12 days to go through a million permutations. I suspect that, for various reasons, it might take longer (maybe a month) on average to reach a winning position. This is because some balls seem to travel faster than others, and because I suspect that the successive positions are too highly correlated with one another. Anyhow, if someone is interested in leaving Firefox open for a few weeks, it might be interesting to see if a winning position is ever achieved. Troubling Moral Underpinnings of "Deal Or No Deal"
Now that the show Deal Or No Deal has clearly become a nationwide sensation, in the top 10 of the Nielsen ratings for the year, perhaps it merits some further analysis. Since a mathematical analysis poses no challenge at all, I now find myself sometimes pondering the show on a philosophical level. The metaphorical premise of the show seems to have underpinnings of Judeo-Christian religion. The contestant is clearly Everyman, you and I. The suitcases represent the many unpredictable circumstances that fill our lives. An important fact (in the show, and in life) is that these circumstances are relatively known quantities - death, love, injury, success, failure - which inevitably come in each of our lives. But at what time and in what order these items will occur is random. Howie represents society. He spells out the rules, and forces us to move through the game. But notice that there is no Jesus character. The only salvation comes from lady luck and the contestant making the correct decisions, as it should be. Giving the contestants a "free pass" abosolution of their mistakes would ruin the game, as the need for the contestant to effect good outcomes would be greatly reduced. Now here is the interesting part. Does the banker represent God or Satan? Clearly he is Satan. This is plain for two reasons. First, he is tempting the contestant to give up on the game in a greedy manner and take a tempting offer. By definition, he offers something that is no better than what the contestant would receive if he proceeded further in the game to accept his random lot. But it is viciously tempting, nonetheless. The second reason the banker clearly represents the devil is how they treat the character on the show as the "evil" banker, cloaked in shadows and hellish red lights, etc. So here is the problem on the show. Initially, everyone roots for the contestant to withstand the temptations of the banker and press on. The problem occurs when a contestant is doing very well. Toward the end of the game, inevitably the tide turns and the contestant is encouraged, and ultimately begged, to give in and take Satan's offer. When he finally can withstand no more, and presses the "Original Sin" button, the crowd cheers wildly and confetti comes down amid hugs from family and friends. In fact, hardly anyone ever makes it through to the end of the show. This all seems to go against what society/religion claims to value. One other interesting note I have observed is that the only people who ever seem to make it all the way through to the end (i.e. actually go home with the amount they had in their original case) are the people who did poorly with their selections. After a while, these people have "nothing to lose" (having eliminated all of the largest amounts), so they are more likely to press on to the bitter end. I wonder if there is an analogy between this and real life. You always hear about lottery winners becoming victims of all sort of temptation and ultimately leading miserable lives. Similarly for mega-millionaire celebrities. But the folks with little to moderate amounts of money seem to somehow do better at persevering through life and resisting temptation.